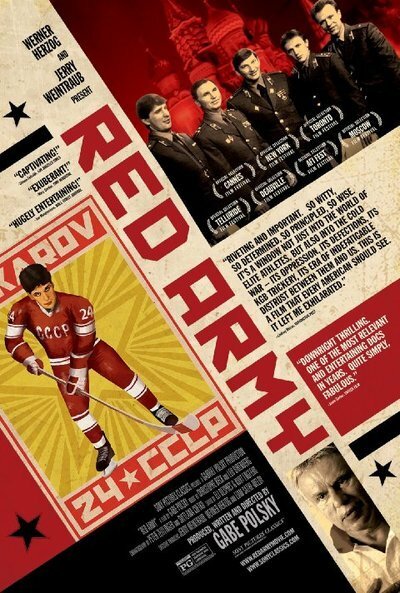 This a great time capsule documentary, providing insight into the post WW II Soviet Union cult of supremacy as manifested in its hockey program. The Soviet military actually ran the tryouts at the Red Army school, winnowing out of the weak and fusing sport with propaganda. The result was a juggernaut that came of age right at the moment it ran into the American team in 1980 at Lake Placid. After that ignominy (the Russians had just beaten the Americans in an exhibition 10-3), the team did not lose a game for the two years prior to Sarajevo, where they won gold, and again, in 1988. However, the toll on the players was brutal. They spent their time in hockey camps 11 months of the year, and the coach, Viktor Tikhonov, would not even allow a player see his dying father. Perestroika loosened some of the restrictions, but still, Tikhonov, would not permit his best defenseman, Slava Fedisov, to go to the NHL. Fedisov quit over the prohibition, made his displeasure public, and was ostracized for his impunity. On the light side, he was denied training facilities. On the harsher, the police in Kiev picked him up, beat him, and then called Tikhonov to pick him up. Eventually, the Soviets allowed the players to play in the NHL, but they took half their salaries (Fetisov said no and was the first Soviet hockey player to get his full check) . The footage – especially of the fluidity of the Soviet team – is dazzling, and the interviews of any number of direct but impatient Russians are sharp and revealing. The documentarian, Gabe Polsky, is to be commended for including footage of his broad questions, where he stretches to get a response on larger geopolitical issues, only to get a “stupid question” from the “suffer no fools” Fedisov. In fact, it was a stupid question, but we learn more in Fedisov’s curt comment than had he answered the stupid question.